Volunteers provide help and care to children with a range of special needs. Care, play with, support learning, nurture creativity and socialization for these children. Volunteers with a desire to contribute to the development of students with intellectual and physical challenges are welcome to join our Children with Special Needs Care project in Costa Rica. Volunteers in this project have the opportunity to work in a school for children with a range of physical and intellectual disabilities. The school offers the opportunity for volunteers to work alongside local teachers to help run the classroom and provide individual attention and care to the children. Please note, this project is available to take volunteers between mid-March and mid-December and is closed for 2 weeks in early July for the summer break. Beginner to intermediate knowledge of Spanish is preferred (but not mandatory). If a volunteer cannot speak Spanish, we suggest that he or she enrolls in our Spanish language program. There are no specific qualifications needed to join this volunteer project in Costa Rica. All volunteers are expected to be open-minded, flexible, patient, and to possess a passion and love for the volunteer service they are providing. This project is best suited to volunteers of a caring and compassionate nature who are patient, and willing to help with a range of duties. Medical students or healthcare professionals who are seeking physiotherapy volunteer opportunities are also able to support physical therapy while volunteering at the centers. Volunteers in this project will be expected to be open minded, patient, caring, and self-starters (able to recognize what needs to be done or who needs to be helped). Volunteers will take care of children and should do so with a caring, positive attitude. Volunteers are expected to maintain a professional attitude and help with whatever task (cleaning, feeding, playing, cooking, laundry, etc.) needed. Volunteers will also be asked to tutor or teach a special skill set and create a class or workshop for them in a particular skill the volunteer has. General tasks include providing care, feeding, physical therapy, education, vocational skills-development, recreation and stimulation, as well as help with cleaning and maintaining facilities. 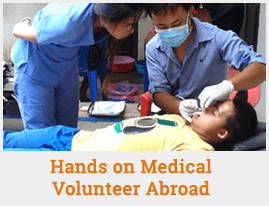 The objective of the volunteer is to work closely alongside the center staff to promote better health and wellbeing outcomes, while engaging in a two-way cross-cultural learning exchange with the people you are working with and caring for.